What's one thing Mark Consuelos and "Riverdale's" Hiram Lodge have in common? Their love for family. And yes, there was that time Lodge basically orchestrated Archie Andrews' death sentence to keep him away from his daughter, Veronica, but it was all with good intentions, as is every move when it comes to family, Consuelos told TODAY. "With Hiram, at his base, he really loves his family and wants them together. I know he goes about it in such a crazy way, I do relate to him. Family is everything to me. That's my priority — my family." As for which character on the show Consuelos would say his real-life parenting is most like? Fred Andrews! "The way I see myself and what reality is are two different things," he joked. "You'd probably have to ask my kids! But Fred's got a really good heart and I'd like to think I'm as understanding as him. And when he says he's going to do something, he does it." 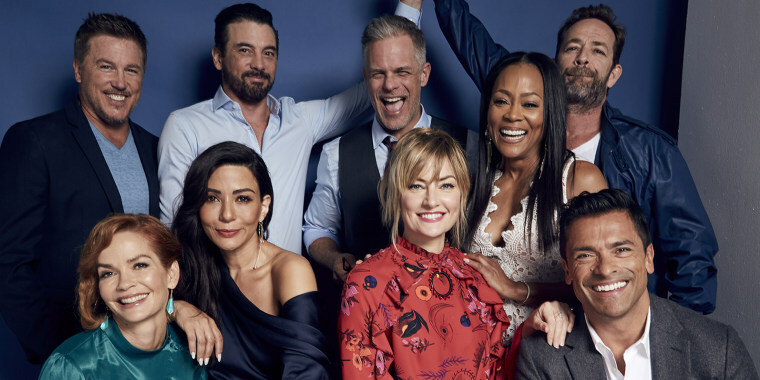 Playing a parent on "Riverdale" has been rewarding for Consuelos in many ways. "I get to work with Camila Mendes, who plays Veronica and it is such a treat. Most of my scenes are with her and Archie, so I love it. I finally get to be on a show that my kids, my daughter thinks is cool. That's a plus!" The young adult actors, who are actually similar in age to Consuelos' own three kids, have even helped him grow. "I've learned some things from them like social media stuff ... how to post certain things, emojis ... I go with the fist pump emoji a lot," Consuelos told us, while promoting a new campaign for McCafé at Home. One thing he'd be certain to give a fist pump emoji to? A climatic story line for Lodge through the end of the season. "I would love a hero's journey or an anti-hero's journey. Like, he's so bad, and then he becomes good! And then he's forced to be bad again ... because even though he tried to be good ... he's just forced to be bad." Given the opportunity to add any actor to the cast, Consuelos would strategically build out Lodge's reign. "Benicio del Toro could come on as my Hiram's brother! He'd be top of my list." We'll be anxiously watching every Wednesday to see the fate of this ever-changing town!